Paramount Pictures has finally firmed up plans for the long-awaited Top Gun 2, setting Joseph Kosinski to direct, reuniting him with Oblivion star Tom Cruise, and announcing a July 12, 2019 release date. We first reported that Joseph Kosinski was being sought to direct this sequel last month, and now his deal has been finalized. While it hasn't been confirmed when filming will begin, a previous report claimed the sequel will start filming next year, which may be accurate given this new release date. Deadline broke the news about this sequel today, although it didn't confirm a previous report regarding the title. Earlier this month, while promoting The Mummy, Tom Cruise teased that that this Top Gun sequel will be called Top Gun: Maverick, because he "didn't want a number" in the title. This report did reveal, though, that the story will follow Maverick, who is now a flight instructor, "teaching the young macho pilots how to do it." You may recall that, at the end of Top Gun, Maverick teased that he would like to teach pilots at the Top Gun school, and it seems that he got his wish, more than 30 years later. Tom Cruise also stated back in 2015 that this sequel will have "real jets" with no CGI, hinting that he wanted to get the Department of Defense involved so they could use actual Navy fighter jets. Whether or not this will happen remains unclear, but it seems that this sequel is actually happening, after several years of delays. This report reveals that the script was written by Peter Craig (The Town), Justin Marks (The Jungle Book) and the writing team of Ashley Miller and Zack Stentz (X-Men: First Class). All of these writers had been brought on years ago, with Ashley Miller and Zack Stentz coming aboard in 2011, Peter Craig signing on in 2012 and Justin Marks boarding the project in 2014. This sequel had been in development for several years prior to this recent spate of developments. Just months before filming was slated to begin in 2012 director Tony Scott died, which resulted in the project being put back on the shelf. A few years later the project got back on track, with producer Jerry Bruckheimer teasing a story line that would pit the iconic Maverick and his traditional fighter pilots against the drone pilots that are being used today. Tony Scott had teased a similar drones story line before he passed away, but it hasn't been confirmed if this aspect of the story will still be used in Top Gun 2. It will also be interesting to see what cast members come aboard as well. Last month, original Top Gun star Val Kilmer revealed on social media that he is "ready" to come back as Iceman, and even Anthony Edwards, who portrayed Maverick's flight partner Goose, revealed he wants to come back, despite Goose tragically dying in the first movie. The actor revealed his desire to return for the sequel in a segment on The Late Show With Stephen Colbert, where he discusses superimposing a "Ghost Goose" into scenes for the sequel. 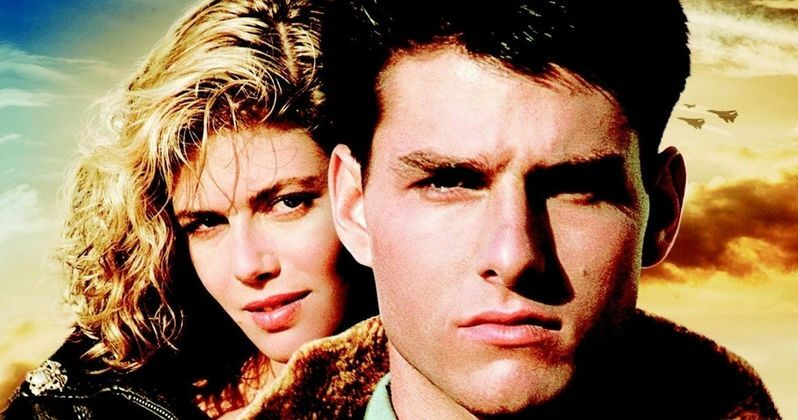 It also hasn't been confirmed if other Top Gun stars such as Kelly McGillis, Meg Ryan, Tom Skerrit, Michael Ironside, John Stockwell or Tim Robbins would return for the sequel. As for the release date, there are no other movies going up against Top Gun 2: Maverick as of now, but it will arrive between Spider-Man: Homecoming 2 (July 5, 2019) and The Lion King (July 19, 2019). Top Gun 2 Halts Production So Tom Cruise Can Learn to Fly Jets?